Saving lives since 1990, the SpeechGuard® is back and better than ever. Now in its 3rd Generation, the SpeechGuard® can and will replace virtually all electronics you use on the job including a smartphone, laptop, cell phone, radio and more. You're at a traffic stop and the person doesn't speak English, just fire up the Voice Translator. You're making an arrest and find an unidentified child in the back seat and pills in the glove compartment; use the Missing Children program and the Pill Identifier. Being caught in a line of gunfire is a worst case scenario and use the SpeechGuard® as a monitor. 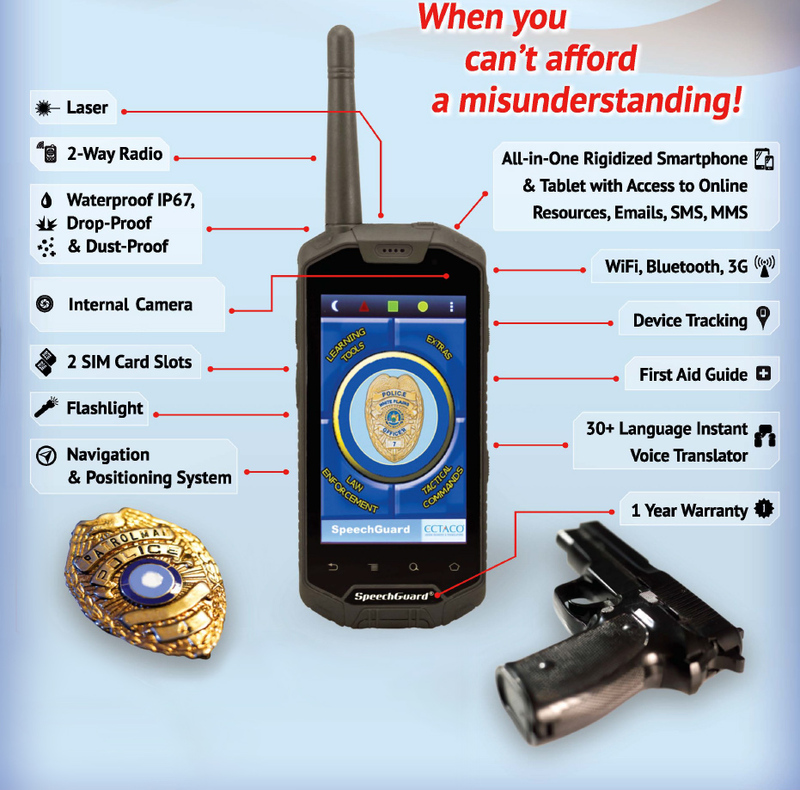 Use the 2-Way Radio to confirm with HQ, take the shot and neutralize the threat once and for all. If any bystanders were harmed in the situation use your extensive First Aid and Medical References to save a life on the spot. The SpeechGuard® even has a License Plate Reader as well as a Digital Sketch Artist. An extra set of eyes can be a lifesaver when it comes to a difficult situation. 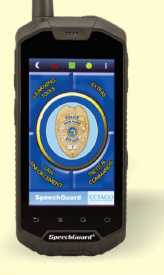 The SpeechGuard® Bluetooth Headset should be a requirement for officers out in the field. Clip the camera (sold separately) on the bottom of your firearm and use your SpeechGuard®'s large, vivid screen to see around corners, down in a hole or anywhere you'd rather not stick your head. At the touch of a button you can broadcast a feed directly to HQ, your superior can advise you whether or not to take the shot or stand down. Footage of the events can be used by in court to prove a threat was imminent and the necessary actions were taken.